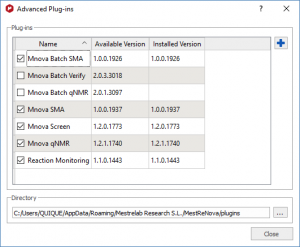 From Mnova 12 you will no longer need to download the installers required for some of the advanced plugins (installers that were not included within Mnova program in the past). It will be all done automatically from Mnova 12. As soon as you load a purchased license (also a trial one) for some of the advanced plugins into Mnova, they will be automatically installed for you. You will just need to re-open Mnova again to activate them. – qNMR, batch qNMR, SMA and batch SMA will appear under Quantitation. – Reaction Monitoring and Screen will appear under Tools. – And finally Batch Verify will be under Verification. For the classic view these plugins will appear under the ‘Advanced’ tab on the main menu apart from ‘Batch Verify’ which will appear under ‘Analysis/Verification’. What happens if you already have some advanced plugins installed from previous versions and you want to update them in Mnova 12? In this case you just need to go to ‘Advanced plugins’ and uncheck boxes for the relevant advanced plugins you would like to update. Once this is done next time you open Mnova will be automatically updated. 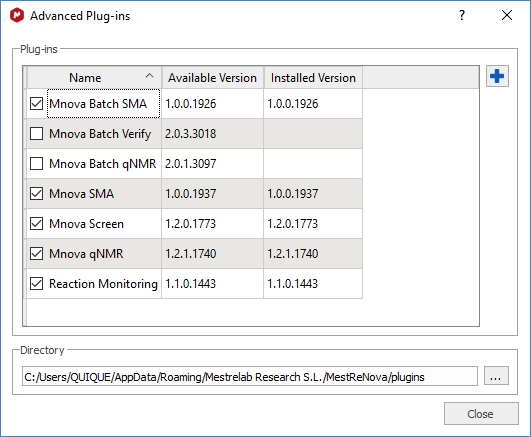 Summarizing, Mnova 12 helps you to install these advanced plugins within the program!